5 Card Stud opens on an after-hours poker game. A tinhorn (card cheat) is caught palming cards. An argument ensues, and the rest of the card players, with the exception of Dean Martin’s character, Van Morgan, take the tinhorn off for lynching. Dean Martin, who was in the commode at the time of the kerfuffle, rides out in an attempt to stop the lynching party. He gets a bop on the head for his troubles (courtesy of Roddy McDowell, the ringleader of the lynch mob), and the tinhorn is hanged anyway. Pretty soon afterward, the card game’s players begin to turn up dead – each the victim of a form of strangulation. Unsurprisingly, suspicions arise amongst the remaining card players as to which of them is responsible for the killings. And who is this gun-toting preacher who has lately shown up in town? El Tarangu remembers really liking 5 Card Stud. For years, it was one of our favourite westerns, and one of the main reasons that we liked director Henry Hathaway. So it was quite saddening when we watched the film again recently and discovered that, in fact, it actually isn’t that great at all. 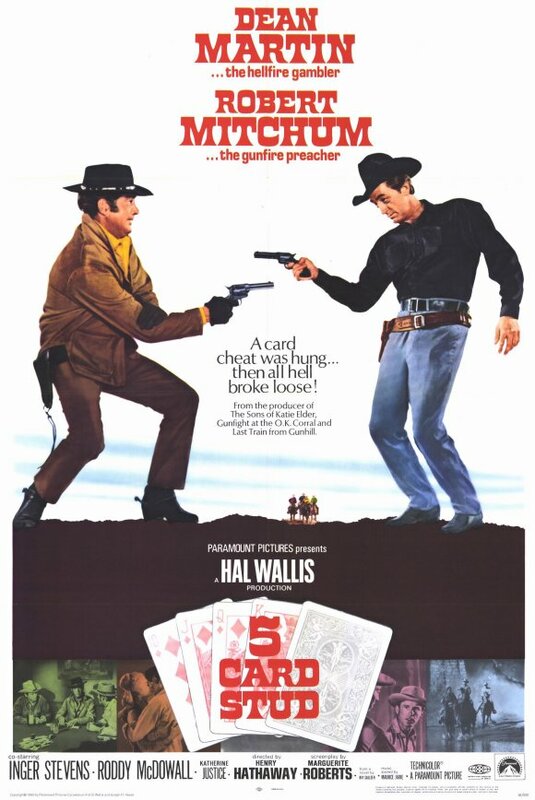 By the late 60s, the western genre was on the wane, and 5 Card Stud has the aura of a film from a genre in decline. From the opening credits, the chintzy theme song (sung by a double-jobbing Dino) gives the film an awfully dated feel. Dean Martin, who at 51 was getting a little long in the tooth for playing romantic male leads, puts in a decent performance as Van Morgan, the dissolute anti-hero gambler. Robert Mitchum is quite good as the psychopathic, trigger-happy preacher (if this sounds familiar, it’s almost the exact same role that Mitchum played in Night of the Hunter, only with a gun instead of a knife). Roddy McDowell puts in the most enjoyable performance in his sneering, weaselly turn as Nick Evers, the lynch mob ringleader. McDowell chews the scenery, with undisguised English accent, in a most delightful manner. 5 Card Stud boasts some enjoyable set pieces. There is a big shoot-out involving half the town, some fist fights, some inventive murder scenes, and a decent showdown at the end. Hathaway uses the nice device of having all the surviving participants of the game meeting up at the card table after each murder; at every meeting, there’s a newly vacant chair. The film remains less than the sum of its parts, however, and overall, 5 Card Stud has a somewhat half-baked feel. The relationship between Dean Martin and Inger Stevens feels like it was thrown in as an afterthought, and the identity of the killer is disclosed too early, rendering the ending a bit of a damp squib in tension terms. 5 Card Stud is actually not bad; it’s just that the film failed to live up to El T’s rose-tinted recollections on our most recent viewing. Buy 5 Card Stud from Amazon. Image from Hollywood Classics Reviews.